Welcome to Share Your Stuff Tuesday! It's such a pleasure to have you join us. :) However, with sadness, this week will be the last Share Your Stuff Tuesday linky party. 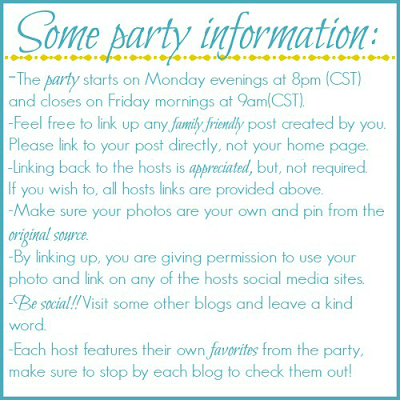 Instead, we will be holding a linky party on Mondays, Inspire Me Monday, starting next week. I also have another linky party starting on Fridays, Five Friday Finds. Please feel free to join in either of these parties! A roundup of the top 5 most popular recipes in August! Five Friday Finds - hosted by Erin at Our Table for Seven in September! What a simple and tasty looking meal! I've been craving dips lately, and this one looks just scrumptious!